Mental health problems are common. We see signs of them every day in friends, family members, co-workers and in our faith communities. We know that without early intervention individuals can be lost to suicide or addiction, sink into deep depression, experience paralyzing anxiety, or endanger themselves or others. Yet most of us are not confident in our ability to help. Our Conference Health as Wholeness Team can suggest workshops and seminars to help clergy and laity address these issues. Below is a bulletin insert often used during Mental Health Month in May. Educate congregations and the community in public discussion about mental illness and work to reduce the stigma experienced by those suffering. Covenant to understand and love people with mental illness and their families. Welcome all people and their families into the faith community. Support people with mental illness and their families through providing awareness, prayer and respect. Advocate for better access, funding and support for mental health treatment and speak out on mental health concerns. 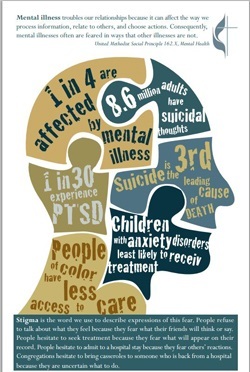 Find more information and resources at umc.org/mentalhealth.